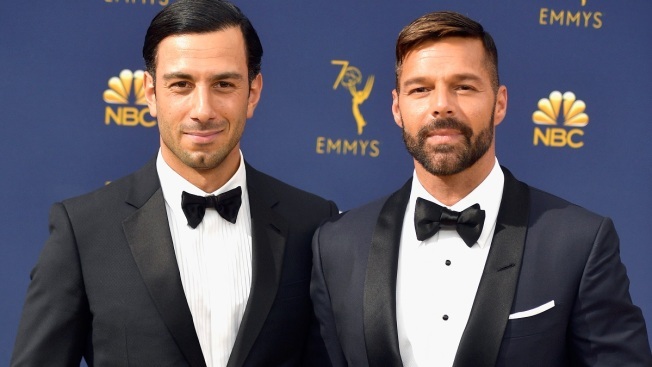 In this Sept. 17, 2018, file photo, Jwan Yosef (L) and Ricky Martin attend the 70th Emmy Awards at Microsoft Theater in Los Angeles, California. Martin's post didn't include any additional details, other than that the baby girl is healthy. Martin's post says his family, which includes husband Jwan Yosef and 10-year-old twin sons, have "fallen in love with Lucia." The "Living La Vida Loca" singer garnered an Emmy nomination earlier this year for his supporting role in the FX series "The Assassination of Gianni Versace: American Crime Story."